Erin Sagin has clear instructions on how to use the customer list in a Search Remarketing campaign on Google’s Search network. 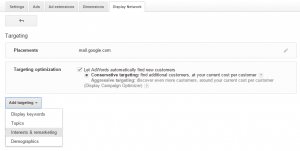 Here I will show you how to use Customer Match to create a Gmail Ad campaign. Once you’ve successfully created and uploaded your customer email list in the Audiences section of the Adwords Shared Library, go into your Campaigns Tab and create a new Campaign. Select Display Network Only from the drop-down and name your campaign. (If you’d like, you can select the bullet point for Marketing Objectives but this is optional.) Put in your settings for Location, Language, Budget, etc. Next, create an Ad Group. 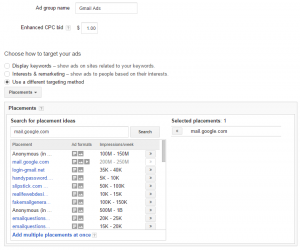 Select Placements from the targeting method drop-down, and enter in mail.google.com as a placement (if applicable). Save and continue. Next step is ad creation which you can skip for now. Back in your ad group view, click on the Display Network tab, then the red + TARGETING button. Here is where you will sync up the customer match email list you submitted earlier in the Shared Library with your ad group. From the Add targeting drop-down, select Interests and Remarketing. Then, under the Select Category drop-down, select Customer email lists, and choose your list. At this point, you can go back in to your Ads tab and upload or create ads. 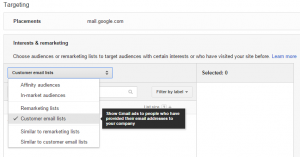 If you are uploading an ad creative, make sure it is compliant with Gmail Ad formats. Otherwise, you can create a Gmail Ad from directly within the Adwords Ad gallery. Important to note: If you create a Gmail Ad from directly within the Adwords Ad Gallery, you do not need to add mail.google.com as a managed placement. The system knows the intention is Gmail. However, if you upload custom ads, you will need to specify the placement. That’s it! You should be all ready to go. We’d love to hear how this new product is working for you! Great post! I really enjoyed reading it. Somehow, every time I want to add a new audience under “interest&remarketing” I need to delete all of my existing audiences, so that I can add new values. When going on the red “+Targeting” button the option to add new interest&remarketing values is no available. Is there an easier way of doing this?